Convert analog to digital AXIS T8640 Ethernet over Coax Adaptor PoE+ is an ideal choice for installation of network cameras where coax cables are already present and may be very long or inaccessible. AXIS T8640 Ethernet over Coax Adaptor PoE+ enables IP-communication over existing coax video cabling and converts an analog system to digital. Full-rate network connection AXIS T8640 comprises AXIS T8641 Ethernet over Coax Base Unit PoE+ and AXIS T8642 Ethernet over Coax Device Unit PoE+. 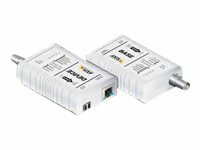 It can also be used in those installations that require PoE transmissions over 100 m. A full-rate network connection is delivered over maximum cable ranges of 500 m, which far exceed most recommended distances for analog video installation.Easy to installFor ease of installation and guaranteed performance, AXIS T8640 features an intuitive LED display, which gives confirmation of network and power status via the cable, with no need to access remote equipment to check connections.